The cornea transparent ‘window’ on the front of the eye that allows the light to enter. Stem cells from the dental pulp of wisdom teeth can be coaxed to turn into cells of the eye’s cornea and could one day be used to repair corneal scarring due to infection or injury, according to researchers at the University of Pittsburgh School of Medicine. 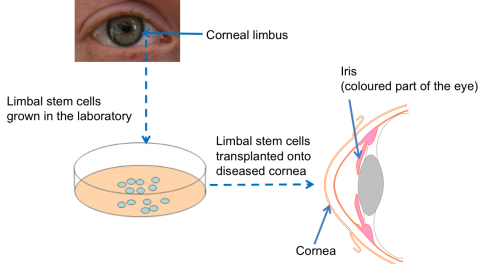 The findings, published online today in STEM CELLS Translational Medicine, indicate they also could become a new source of corneal transplant tissue made from the patient’s own cells. “Shortages of donor corneas and rejection of donor tissue do occur, which can result in permanent vision loss,” Dr. Funderburgh said. “Our work is promising because using the patient’s own cells for treatment could help us avoid these problems. Experiments conducted by lead author Fatima Syed-Picard, Ph.D., also of Pitt’s Department of Ophthalmology, and the team showed that stem cells of the dental pulp, obtained from routine human third molar, or wisdom tooth, extractions performed at Pitt’s School of Dental Medicine, could be turned into corneal stromal cells called keratocytes, which have the same embryonic origin. The team injected the engineered keratocytes into the corneas of healthy mice, where they integrated without signs of rejection. They also used the cells to develop constructs of corneal stroma akin to natural tissue. “Other research has shown that dental pulp stem cells can be used to make neural, bone and other cells,” Dr. Syed-Picard noted. “They have great potential for use in regenerative therapies.” In future work, the researchers will assess whether the technique can correct corneal scarring in an animal model. Transplantation of limbal stem cells from a healthy eye can repair the cornea and give the patient back their sight. However, this procedure carries some risks to the healthy donor eye and to the patient, and other problems mean the approach isn’t ideal. For example, if a patient has damage to both of their eyes, it may not be possible to obtain any limbal stem cells. 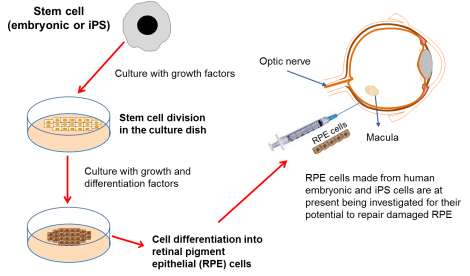 Cells from a donor can be used, but donors are in short supply, success rates are lower, and donor cells are usually only effective in the short to medium term. Retinal pigment epithelial (RPE) cells have a number of important jobs, including looking after the adjacent retina. If these cells stop working properly due to damage or disease, then certain parts of the retina die. As the retina is the component of the eye responsible for detecting light, this leads to the onset of blindness. RPE cells can be damaged in a variety of diseases such as: age-related macular degeneration (AMD), retinitis pigmentosa and Leber’s congenital aneurosis. One way to treat these diseases would be to replace the damaged RPE cells with transplanted healthy cells. Unfortunately, it is not possible to take healthy RPE cells from donors so it is necessary to find another source of cells for transplantation. Scientists have recently produced new RPE cells from both embryonic stem cells and iPS cells in the lab. The safety of embryonic stem cell-derived RPE cells is currently being tested in a clinical trial for patients with Stargardt’s macular dystrophy, and it is hoped that a similar trial will follow for patients suffering from age-related macular degeneration (AMD). Replacing retinal pigment epithelial cells: Techniques for growing cells for therapies are being researched and tested in early clinical safety trials.